You might be concerned with the notion that Russian President Vladimir Putin “hacked” the U.S. presidential election, as it were. It’s psychological warfare for a new world, we’re told, and Cold War II will be fought over the internet. But Russia’s nuclear weapons didn’t die with the first Cold War, and you shouldn’t forget about them for a second. In case you’ve missed it, Russia has taken significant strategic actions over the past few months. 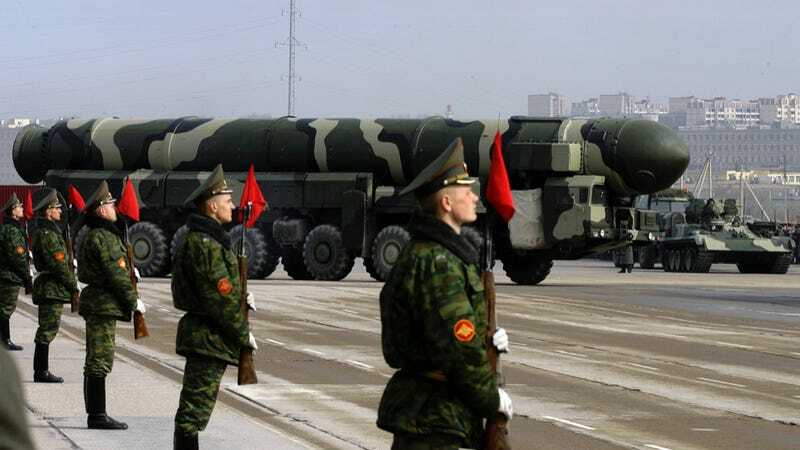 In October the country deployed nuclear-capable missiles to its Kaliningrad region, which borders the Baltic states that are members of the NATO alliance. Just a few weeks ago, Russia tested a nuclear capable drone submarine that could be used against U.S. bases and ports. “Kanyon,” the Pentagon’s code name for the drone, will reportedly carry megaton-class warheads, the largest nukes in existence. And while it’s not exactly a new idea, Russia looks to be plowing ahead with it. “The Status-6, a nuclear powered, nuclear armed drone submarine, is the most irresponsible nuclear weapons program that Putin’s Russia has come up with,” he said. This may have something to do with the fact that Russia’s economy is still in the tank, although the International Monetary Fund expects it to recover in 2017. That said, Moscow isn’t really in a position to upgrade its aging military. This has a lot to do with the fact that it has been forced to cut its defense budget, due to falling oil prices and budget crises. And even when it was flush with oil cash over the past few years, it couldn’t hold a candle to American defense spending. Whereas the U.S. military has been focused on small-scale conventional wars for the past 20 years, Russia hasn’t had the luxury of funding the massive military procurement for similar conflicts. It’s still mired in thoughts of existential threats, primarily from the United States and Europe. And when it’s facing what it perceives to be a threat to its very existence, the most cost-effective move for Russia isn’t to invest in new communications systems, massive naval architecture, and huge weapons programs, like the American F-35. It’s finding that a strong nuclear component may be the answer. In other words, if Russia can’t afford to upgrade its military the way America can, it’s going relatively big on nukes instead. More troubling than all that, indeed, is that Russia recently pulled out of a 16-year-old deal with the U.S. in which both agreed to get rid of plutonium that could be used in nuclear weapons, citing “hostile actions” by America. The withdrawal was a major setback because such deals were designed to avoid a nuclear arms race that could produce such developments as the submarine drone test. The trouble with the prospect of a nuclear weapon being fired is that there is no going back. Many experts believe their is no real defense against a nuclear attack. And by the way, Russia and the United States already own 93 percent of the world’s nuclear weapons. Philip Coyle, who was Associate Director for National Security and International Affairs at the White House Office of Science and Technology Policy under President Barack Obama, said America’s current Ground-based Midcourse Defense (GMD) anti-ballistic missile systems aren’t designed to stop a nuclear attack. “We do not have a missile defense system that can stop an all out attack from Russia or China and it would be foolish to try and build such a system,” he said. Coyle added that the GMD’s performance has been “abysmal” in flight intercept tests, in part because of the technology is so difficult to perfect. Jim Walsh, a nuclear arms expert who has testified before United States Senate and House of Representatives on nuclear terrorism, told Foxtrot Alpha that while it’s quite unlikely that Putin will actually attack the U.S. with nuclear weapons, his boasting of his country’s nuclear program is concerning. The fact that no country has the capacity to fend off a nuclear attack makes efforts to cut down the number of nukes that are deployed and stockpiled on both sides even more critical. What is disconcerting, however, is that president-elect Donald Trump has said essentially nothing about his plans to work with The Kremlin to curb Putin’s reliance on nuclear weapons or stand firm in his defense of our NATO allies. A December 1 memo of Trump’s defense priorities doesn’t mention Russia, even though the Pentagon considers Moscow America’s number one military threat, according to a report released today by Foreign Policy. Indeed, Putin’s hacking of the U.S. election should dominate the news cycle, but we can’t ignore the reality that Moscow is bolstering its nuclear weapons program in ways that signal an escalation of its fears of NATO. While Trump’s team can attempt to deny that Putin hacked the billionaire to victory, they cannot ignore the clear signs that the former spy is readying for the possibility to nuke America to submission if he feels he has to.